Happy Thursday!! 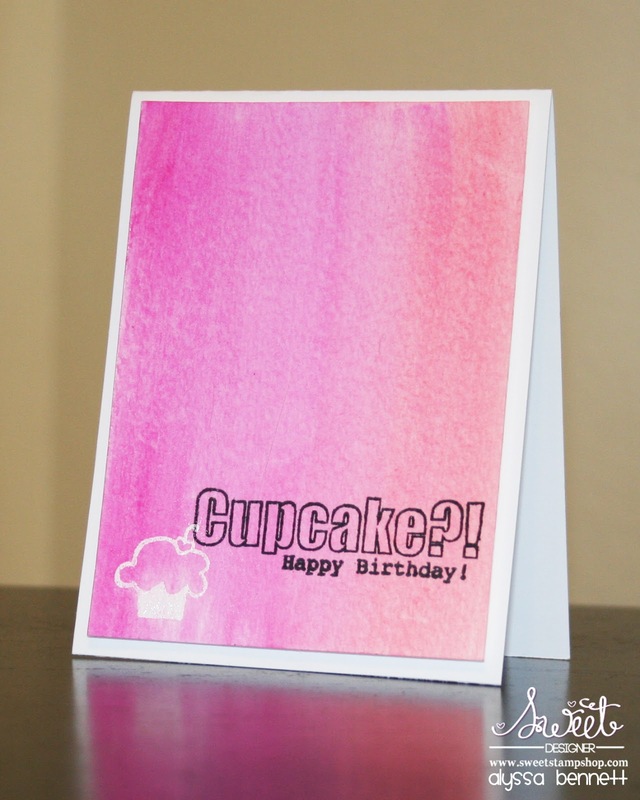 I'm on the Sweet Stamp Shop Blog again today with another Triple Sweet Thursday post for you where I will be spotlighting another challenge and rocking it three different ways to get you inspired! Seize the birthday is a bi-monthly challenge (every two weeks) that is an anything goes birthday challenge with a TWIST. With every challenge you have the option of anything goes as long as it is birthday themed. BUT, they also offer a "topping" that is an optional inspiration word for those of you who, well, want to be challenged. You may enter up to 3 cards per challenge. Entries are judged and after each challenge a "Take the Cake" winner and three "Birthday Honours" are chosen. First and foremost: ANYTHING GOES. Who doesn't love a good old fashioned anything goes challenge?! The only catch: it must be birthday. So if you made a birthday card this week, ENTER IT! But what's even better than an anything goes challenge? An anything goes challenge with an OPTIONAL INSPIRATION. I love how Seize the Birthday offers an optional "topping" for you to use as inspiration, but you don't HAVE to, so everyone can play along! Maybe one week you just aren't feeling the "topping," no biggie, just make a birthday card! Maybe the next week you are really looking to be challenged, no worries there either, they've got you covered! HERE is the current challenge at Seize the Birthday. The "topping" for this challenge: Monochromatic. For this one I used a paint brush and a little water color paint to splatter the background. 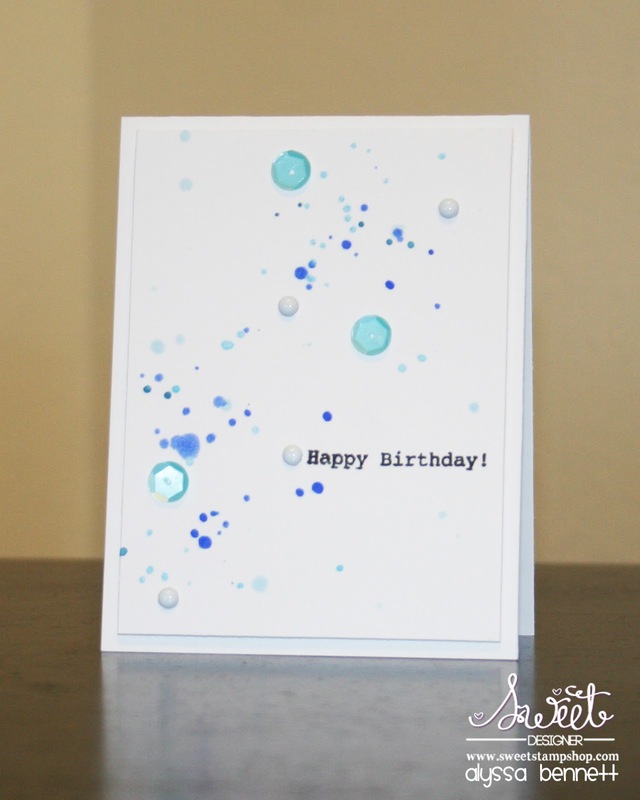 Next I stamped my "Happy Birthday!" sentiment from the Sweet Stamp Shop Easily Distracted stamp set. Finally I added some enamel dots and sequins and ta-da! For my next card I turned to my favorite trend: water color! Yet another style I felt would lend PERFECTLY to the monochromatic "topping"! 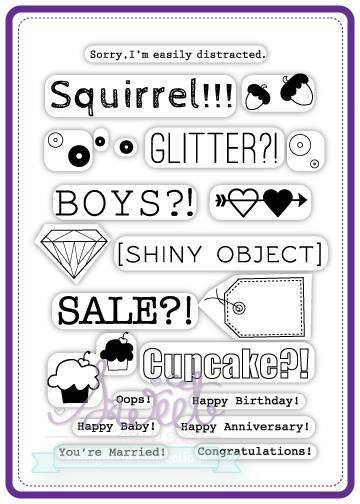 I stamped and embossed the adorable little cupcake from the Sweet Stamp Shop Easily Distracted stamp set (again, I know, I am just in LOVE with this new set!!). Then I did a wash of pink water colors. Once that dried I stamped my "Cupcake?!" and "Happy Birthday!" sentiments also from the Sweet Stamp Shop Easily Distracted stamp set. Another fun way to showcase a monochromatic color palette is to create your own stamped background. 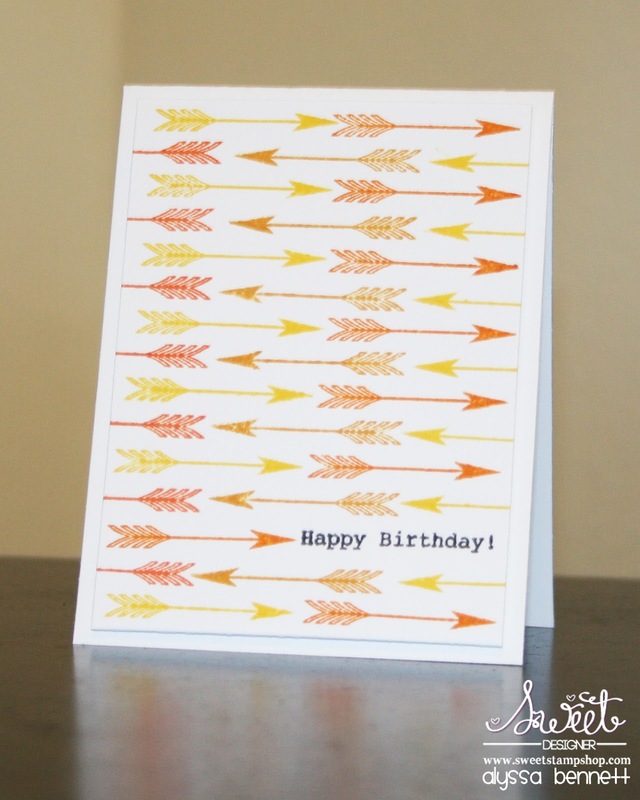 For this one I pulled out the fun arrow from the Sweet Stamp Shop Made By 2 stamp set and the same "Happy Birthday!" sentiment from the Sweet Stamp Shop Easily Distracted stamp set. I have to apologize because one of my "orange" inks came out quite a bit yellower than I expected. BUT the awesome thing about Seize the Birthday is that even if my card does not qualify as monochromatic, it still qualifies for anything goes! TIP: If you aren't comfortable stamping your own backgrounds just yet I recommend stamping out your background on a larger piece of paper first, giving yourself space for trial and error. THEN cut out the card bas from an area of the pattern you created that you like. This way you can choose where the edges of the pattern are, rather than risking your pattern not coming out even on your pre-cut card base. This "topping" was pretty FUN, no?! If you play along with Seize the Birthday I'd LOVE to see your entry! Be sure to leave me a comment with a link so I can leave you some love!! I'll see you again next week for another Triple Sweet Thurday! !